Sirisa Village 12. 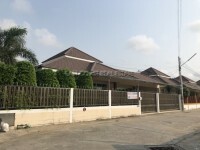 A modern village set just off from the Bangkok motorway and Sukhumvit Road in the North area of Pattaya City. You will enjoy immediate access into the city, or the surrounding industrial parks of Rayong, Map Ta Put, Chonburi or Laem Chabang. There are plenty of schools and lots of local businesses in the area. This property is a large 3 bedrooms, 3 bathrooms, two storey home, with a good sized garden and off road parking. Air-conditioning throughout. Water tank & water pump. New renovation. Unfurnished. The Village provides a nice village setting with 24hr security gated community and a communal swimming pool and gymnasium. It is available for SALE at 7,900,000 THB in Thai ownership with 50/50 on transfer fee & taxes.